For the last several days Jonathan has been suffering from a pain in his lower chest area. The pain was present both day and night and caused a great discomfort. So, today we went to the doctor; diagnosis...heartburn. Heartburn? This seemed so odd since Jonathan is lucky to eat once a day because of his school schedule; but the doctor said not eating normal daily meals can cause heartburn. The doctor put Jonathan on a bland diet, for 2 weeks, and told him to take Maalox before each meal and right before bedtime. Plus he gave him a prescription for Nexium. When we went to the pharmacy to have the prescription filled the cost was going to be $125.00 for 20 pills! Wow, was that ever a shock! $6.25 per pill! After much thought I decided that half the battle would be won by taking the Maalox and eating the bland diet. So instead of purchasing the very high priced prescription pills I decided to try an over the counter generic version of Prilosec. Hopefully Jonathan will see signs of improvement by tomorrow. A few weeks ago I began saving eggs that I knew to be fresh and prepared them for hatching. Then I dug out our incubator and cleaned it up. We put in a digital thermometer and began recording the temperature; unfortunately after less than 3 hours the incubator began loosing heat and then we had no heat at all. I think the heating coil went out and so we are now without an incubator. So, Pat called a friend who agreed to hatch our eggs in trade for half of the chicks. And today we picked up some of the newly hatched baby chicks. They are the cutest little puff balls! The weatherman said we would be getting some winter weather today and he was right! There isn't much snow; just a lot of high winds. Well, today was the big day; box number one contained 4 eggs. Box number two contained 4 eggs. Box number three contained 2 eggs. And box number four contained 6 eggs. And she was so happy to have all the eggs inside the chicken house! The egg basket looks so nice filled with fresh eggs! 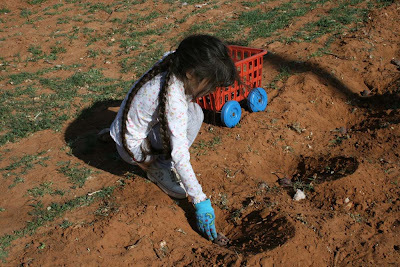 Now that the chickens are a safe distance from the garden area Elizabeth and I were able to plant our potatoes. We have been slowly hoeing the weeds and breaking up the dirt to get ready. I dug the holes and Elizabeth placed the potatoes into them. Next we watered them really well. 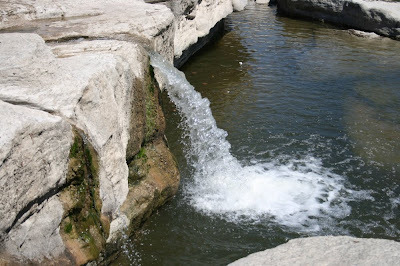 Tomorrow the weather is suppose to turn cold so I am glad to have our "outdoor" activities completed for now. 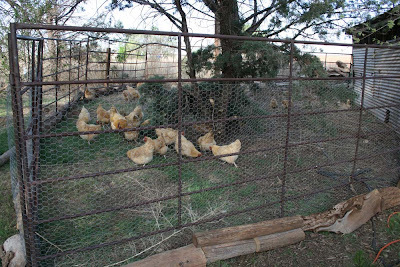 All day yesterday I worked on the chicken pen covering panels with chicken wire and hauling logs to lay along the bottom edge. Then bright and early this morning Pat helped me clip the wing feathers on each chicken so it would not fly over the fence. 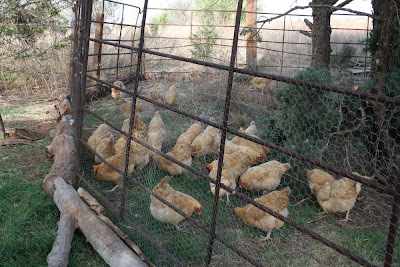 As we finished up with each chicken we tossed it into the new pen. 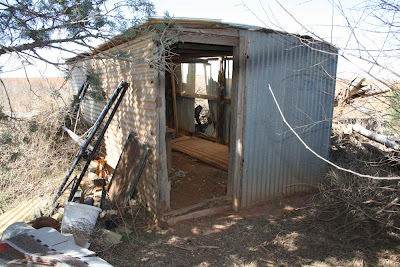 I am pleased with the amount of space they will have for now but hope to make a second pen, on the other side of their house, at a later day. 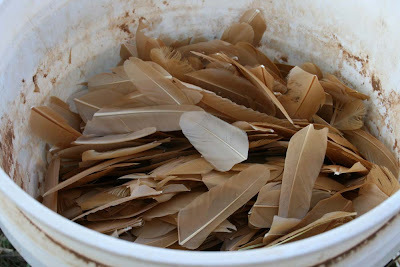 Once we had all the wing feathers trimmed it was time for a small door to be made on the side of the house. On the inside there is a panel that slides back and forth so this small door can be closed at night. 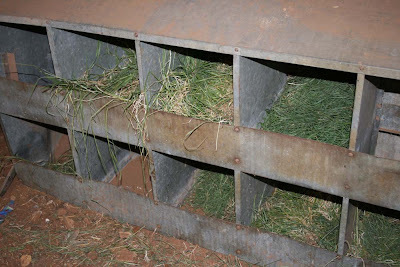 Yesterday, while I was working with the fence, Elizabeth gathered grass for the egg boxes. Now everything is finally finished with the chicken house and pen; and we are looking forward to having all the eggs in one place! Over the years I have learned that a recipe is more than just ingredients; it is also technique. So as I was reading the instructions in my new vintage cookbook for baking powder biscuits I decided to make the biscuits by hand instead of using my mixer. I even dug out my biscuit cutter so they would be round. When the timer went off and I pulled out the pan here is what I found; tall biscuits! I promptly added some margarine to one and my oh my it was so good! Then I added some homemade apple jelly to one of the biscuits; such a sweet success! Cut shortening into sifted dry ingredients. Add liquid to make a soft dough; using more milk if needed. Roll lightly or pat into a sheet, cut into rounds. Place on a greased pan. Bake 450 degrees F. 12-15 minutes. Today I stumbled upon an unexpected bargain at Hobby Lobby; I went there for a roll of ribbon and walked out with this; 9 skeins of pure wool yarn at $1.99 each! I just love old cookbooks! 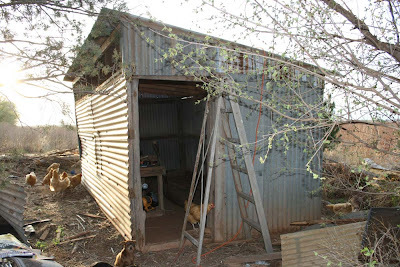 Today we worked all day on the chicken house. We began this project because the chickens didn't want to have anything to do with the old house since it was so far from us. The new house was originally a greenhouse that was used to store a lot of junk. This is how it looked after all the junk was removed. 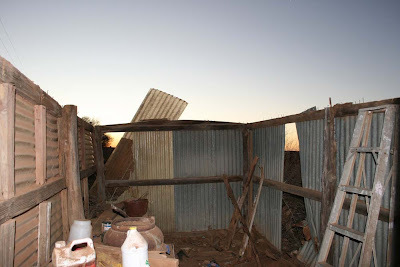 A tree had fallen on it during a storm and caused a lot of damage to the tin leaving large openings. And re-framed it; making it higher on one side. After the framing was complete we began replacing some of the crushed metal. 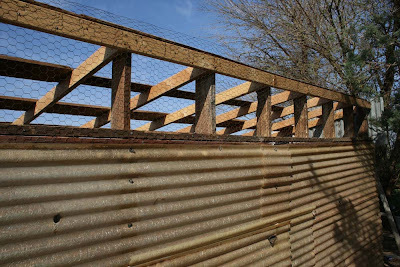 The area of roof that was raised was then covered with chicken wire to let in light and cool breezes. 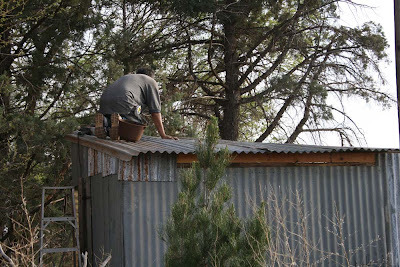 Here Pat is nailing down the new metal roof. 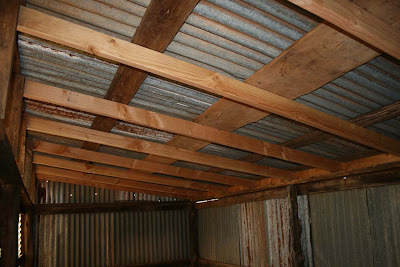 And here is how the roof looks from the inside. 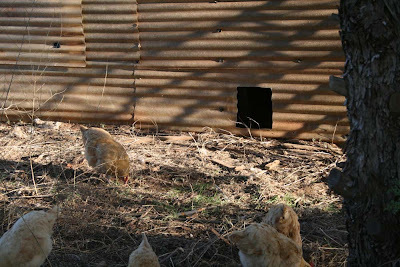 The new chicken house is complete except for a door. We were anxious to have the chickens get used to their new house so we put up a temporary door for now and locked them up this evening. While I was in the house giving Elizabeth a bath Pat and Jonathan went to check on the chickens; they found several of them up on the ledge trying to get out through the chicken wire at the top of the house. This is just too funny! 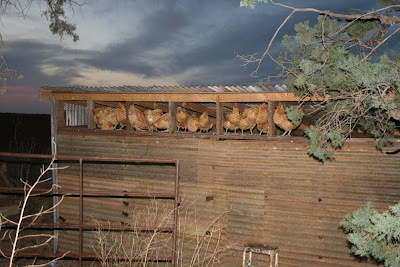 Now that the new chicken house is pretty much finished I can get their fenced in yard ready; I have been concerned about the chickens being killed when they go across the road to forage in the pasture and I have also been concerned about the coyotes getting them too. When we were in Austin my sister took us to an incredible hamburger place that served organic food; we had burgers, fries and drinks that were so tasty. Elizabeth had a kids meal that included a pomegranate flavored lollipop. After trying the lollipop Elizabeth declared it was just "SO GOOD" and so good it was. Jonathan put the wrapper in his pocket so we could look for them later. Soon after our meal we headed to a Whole Foods market and found more lollipops. We were able to buy grape, watermelon, strawberry, mango, blueberry, and pomegranate. So far each flavor has been incredible! These are simply the very best lollipops we have ever tried. So, if you have a sweet tooth be on the lookout for Yummy Earth lollipops; they are so worth the money! 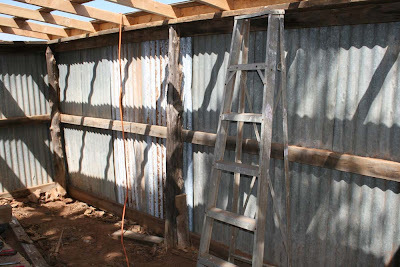 And moved some cattle panels to be used for a chicken pen. 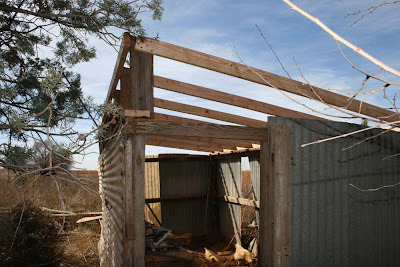 We have been slowly working on fixing up an old building for a new chicken house since the chickens want nothing to do with the old chicken house. She has 12 eggs under her. Our spring break trip has now come to an end. 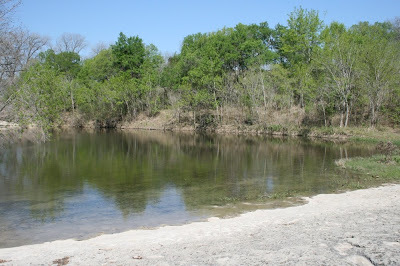 We left Austin at 6:00 AM this morning and arrived home around 2:30 PM. It was so much fun! In the 6 days the kids and I were gone I only had time to visit one Goodwill; I found this book for 25-cents; And these metal measuring cups for 59-cents. Tomorrow I will tackle our mountain of dirty laundry; plant some tomato seeds; and do a little reading. It sure feels good to be home! 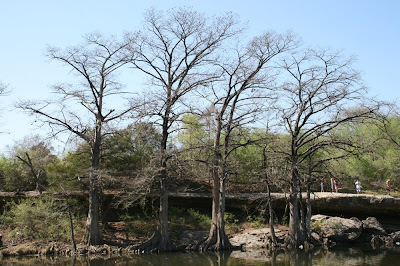 Today we went to McKinney Falls and walked and walked and walked. 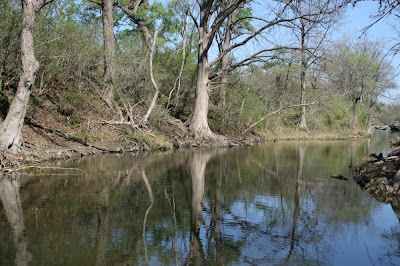 It was so pretty with trees and water everywhere. 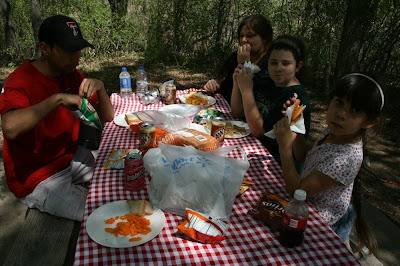 After walking for awhile we took a break and had a picnic lunch; food sure taste better when you eat it in the great outdoors. But it was ice cold! 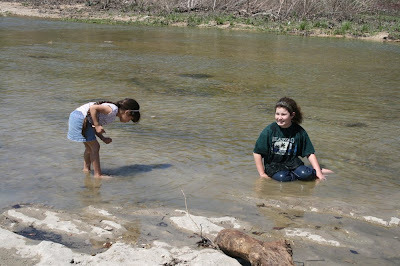 But the cousins didn't mind the cold one bit; they had a lot of fun getting wet.